OK, having built my party, as described in the last diary, I set off on my adventure. Well, I didn’t expect this to be a walk in the park. To Battle! This looks like a pretty easy battle to be honest. I’m facing three Beech Saplings. They’re minions in a group, which makes things a bit easier, because they all share a single deck and each minion can only attack once per Round. In addition, they’ve only got 12 health each, which should make them pretty easy to take down. I don’t know anything about their actual cards yet, other than that I can see that their default move card is Walk, a slow 2 move point card – nothing to worry about there. The map is a relatively open 12×12 with a bunch of trees spread around. I can tell from their black outlines that they’re blocking terrain which I won’t be able to move through or see through. Should give me a few opportunities to dodge around but I’m unlikely to be able to take advantage of any real choke points. OK, let’s look at my initial hand. Each round every character in your party draws two cards plus your default move card. The default move card is the Run card with the eye symbol on it, showing that your opponent knows what it is. In addition, in the first round of every battle you get an additional draw to start you out with some more options. This is a great opening draw! I got two gold cards: one powerful attack and one card drawing card. In addition, I got another solid attack in Violent Swing. Now, I really need to make sure I manoeuvre Sir Otto into range so that he gets a chance to use these cards. Remember that you can only keep two cards at the end of each round. Brilliant Thought is going to net add another card to my hand when I play it, so if I draw two more attack cards and don’t get into range, I’m going to have to throw three of them out, which would be very sad. Alright, that’s Sir Otto. What did Thorgon get? This is a nice hand too – not quite so awesome, but very solid with three bronze cards. You’ll note that Thorgon, being a dwarf, only gets the Walk card as his default, not the Run that Sir Otto has. He makes up for that with increased health – despite being a Priest, he’s got 24 health compared to Sir Otto’s 23. Heal is obviously going to be useful, but can be a challenge to play out on the first turn. Inspiration allows another character to draw a card – a nice flexible card that I can use as I see fit later in the round. And Draining Touch is a weakish melee attack that restores health if you do damage. Hmm, looks like Thorgon should be considering closing the range on those saplings as well. With his single move card that could be a problem though if they hang back. Not a big deal though, since I can almost certain make use of Inspiration and Heal even if I can’t get into melee range this turn. Three more bronze cards is good and this is a nice combo too. Two damaging Bolts, cards with decent range and OK damage, as well as a single Fork. Fork is a triggered card that automatically copies your Magic attack onto the closest additional target. So, that should be easy to leverage against these slow moving trees and effectively gives me two copies of my best ranged attack this turn. Alright, enough thinking – let’s fight! Normally I’d want to get Sir Otto out in front to make sure he gets hit first and stops the enemy closing on my squishy wizard but, in this case, he doesn’t have any armor or blocks in hand, so that’s not quite so important. I’m out of range with my Bolts so far, so I think I’ll just sit back and see what the saplings do. I’m pretty sure they’ll close the range on me, so I just pass. As an aside, passing like this is a bit dangerous since I have such a great hand. If the enemy calls my bluff and passes too, that will end the round and I’ll have to throw out a bunch of great stuff. I take that chance. The first card the saplings play is Combustible! That’s a nasty drawback card that makes them take more fire damage. It relies on a game mechanic I haven’t explained yet, so I won’t go into any detail. It makes me doubly sad that I didn’t manage to find any Fire based attacks when building my party. Oh well, a blown chance. 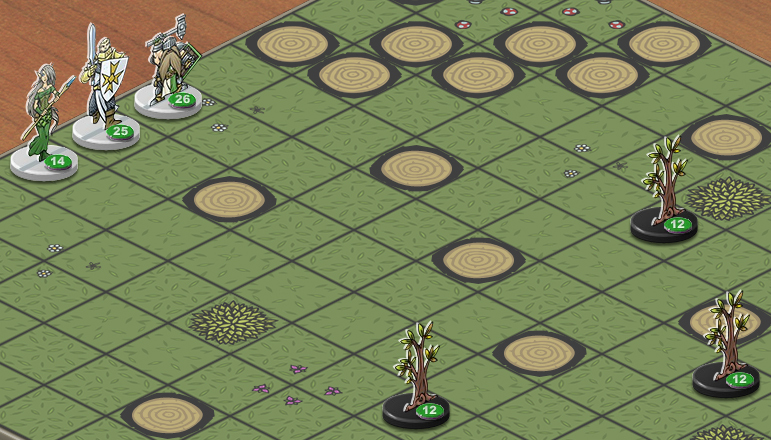 The next play makes up for that – it turns out the saplings got a really bad draw. They play a simple Walk card that triggers two Slowed cards! Slowed is another drawback that has a 50-50 chance of reducing your Move cards by one point each. The computer rolls a 3 and 5, so one of the Slowed cards triggers, reducing its Walk to a single move point. The saplings all amble forward one square. The image is a bit tiny because we don’t show your opponent’s hand full size in game. You can always zoom in on the cards to see them full size. Anyway, you can probably just about see the two orange Slowed cards there which got revealed when the saplings made their sluggish move. There’s also another exposed Walk card, so I know they can probably tip-toe forward another square this turn. With only one more card, so far unrevealed, in hand, I really want to close the range this turn and get some hits in on them. That’s probably going to be up to me now and I don’t have a lot of tools to do it with. Those Slowed cards might end up hurting me! It’s my turn now and I think I’m going to take the chance to play Brilliant Thought, which is a card drawing and filtering card. It’s actually this card which we previewed earlier and then renamed. I’m hoping it will turn up a move card for Sir Otto. Damn! I get three good cards, none of which are what I want: Mail, Staggering Chop and Reflecting Block. I can’t really use any of these if I don’t close the range so I just chuck out the Mail card which is the least objectively powerful. Now it’s the computer’s turn again and I get a break! As expected, it plays another Walk card to move forward and rolls a 2 and 3 for the Slowed cards, failing to trigger either of them! This foolish move on the computer’s part brings Sir Otto well within range and I play Run to move him forward. The computer responds by smashing him with a 6/2 melee attack. That triggers the Reflecting Block I just drew and I roll a 5, causing the attack to rebound on the Sapling! This little tree is going down. 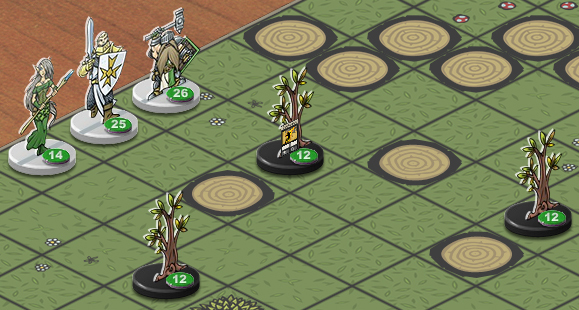 The sapling is down to 6 health and I have three great attacks in hand. I pick the weakest, Staggering Chop, which does exactly 6 damage. I can see the computer’s whole hand now and all it has left is those two Slowed cards, so I know it won’t be able to block or otherwise reduce the damage. Timber! One Sapling down, two to go. I score a victory point and the computer is forced to discard a card. It passes. I can almost picture the dejected look on its face. I’ve still got those couple of Bolts in Elva’s hand and the Fork. The Fork is actually a bit of a problem now, as I’m not sure if I can manoeuvre so as to hit both Saplings with it and I don’t want it to hit Sir Otto by mistake. Anyway, I scamper Elva into position. I play out the Sorcerous Bolt, the more damaging 4/6 of my two bolts and it forks onto the other Sapling. I follow this up with a single Skillful Bolt. Its special ability which makes it hard to block is wasted here, since the Saplings have no defenses, but I shouldn’t cry about that. As a last option, I play Inspiration on Sir Otto, hoping I’ll draw another move card that can get him into range to finish off another Sapling…. and, I turn up another attack card, Strong Chop. Oh well, one tree down and another at half health is a pretty good first round. I pass, ending the round. I have to throw out two cards, but I can live with that. The next round is pretty straightforward. I get another decent draw and manage to finish off the last two trees in a single round. This is easy! Of course, the first battle in an adventure is usually quite simple. This was a pretty unbalanced fight and I’m sure I can expect more challenges as I head deeper into the forest. But before then, let’s get looting! Here’s what I turn as my reward from the battle. 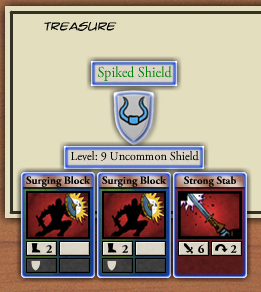 Hmm, a level 9 Uncommon Shield. It’s not as good as the Polished Shield that Sir Otto is carrying, but it does have an interesting card suite for a Shield. Two Surging Blocks that combine movement and defense and an attack card. That could come in handy if I’m trying to put together an aggressive build for my warrior. In any case, it will also be worth something at the shop, so I load it onto trusty mule Ben and head off down the forest path. What wonders and terrors await me around the next corner of the musty forest? Come back next week to find out! Disclaimer: once again, this walkthrough features quite a bit of placeholder art. You might notice that sapling portrait is a dummy! That’s because their figures are still in the art pipeline being carefully hand-crafted. The treasure chest and several other bits and pieces are also placeholder. This game is still in development! I want to play it, too! Oh yeah… that spiked shield looks like my kind of weapon. My mobile spear using fighter likes the look of those move cards and range 2 stab. “Still in development”…but it sounds like you’re getting there! I like the sound of this game. Looks like a lot of fun. SurgeonFish, I do hope you realize that as far as everybody outside of the US is concerned, *you* spelled manoeuvre wrong. Ha ha, I’m loving the maneuver/manoeuvre debate. My PC is configured to do Australian English spelling so it guilted me into changing it from maneuver (which I can actually spell) to manoeuvre, which I can barely get right even with assistance. Can’t wait till u start beta. I’m totally going to sign up! Nah, that’s how we spell egde in Australia. Heck, I think “maneuver” still has a few too many vowels in it. Let’s go with “manuver” – see? much better. This looks soooo good! Waiting for this is doing me actual physical harm. Any chance you would include editing tools? I would seriously consider using this as the combat system for tabletop roleplaying. You can see the editor in action here: http://www.youtube.com/watch?v=nMhkMVIbKTM. All you can do with that is make boards though. Full mod tools would be really hard since this is a server based game. I have a tiny question, is there a difference between the cards “run” and “scamper” ? Yes, Run is a 3 move point card with no special abilities. Scamper is also 3 move points but has Free Move, which allows you to move past enemies without stopping (and also move through difficult terrain without stopping). Is there a date when beta comes out? Or when are we going to expect a realease?